This crystal Irish body jewelry from The Irish Gift House features Kiss Me and, lips and a shamrock. The Irish body jewelry is superior to a temporary tattoo because it has shimmering crystals. This St. Patrick's body jewelry suggests that you pucker up and Kiss Me. 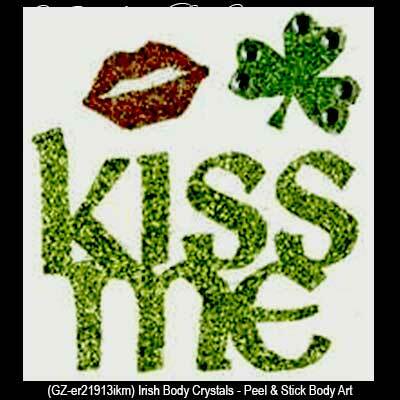 The 3 piece set of peel and stick body art includes red crystal lips and a green crystal shamrock and lettering. The Kiss Me Irish body jewelry measures 1 3/4" wide.